Welcome to Scale-X-Racer, a place for slot cars, track plans, scenery and general motorsport. 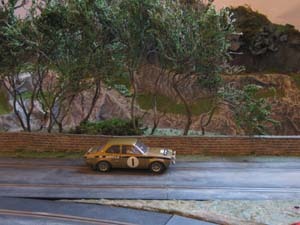 The Ultimate Racer track library, for scratchbuilt slot tracks progresses, with regular new additions. Roads aren't black. Here's one way to put some character into your plastic track. Six new cars, two new kits. Some real beauties, and others less so. The Auto 64 Rally visited Hunmanby Raceway for a special summer rally stage. 102 Circuits for Scale X Racers is now here, featuring 102 track designs with stock lists. We've got loads of Scalextric track plans, from real world circuits like Silverstone and Suzuka, to space efficient ideas for setting up your own track. 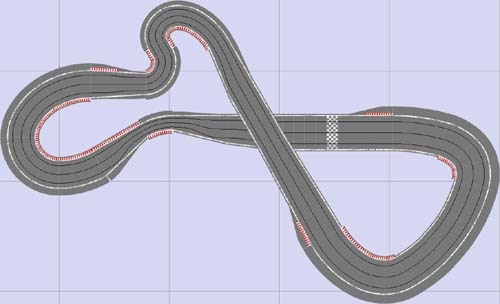 We're also producing an Ultimate Racer track library for designing routed or scratchbuilt tracks. Some of the Scale X Racer stable. The cars we've got, their drivers, the categories they fit into and the circuits they race on. Well, yes, why not? Just because few people do it, doesn't mean it can't be done. So here are some ideas. We've got printable buildings and backdrops to download, cheap, easy to make trees and various static models and figures.